Every profession requires training in order to learn how to be effective in the position. In our profession of education, our training began with college. We received our degrees in a particular focus area. Once licensed, in order to stay current and keep our license we are required to complete a certain number of hours of professional development. Most of these hours are offered in the summer while teachers are “off” (yes, I am giggling at the thought of not working in the summer!) and can attend full day sessions on a particular topic. When school begins, we search our notes and try to remember what it was we were trained in and how we begin to implement the learning that occurred weeks back. After 17 years of service in education, I have come to an understanding regarding professional development: If educators wait for training to be offered, children are waiting to be served in classrooms. Kids cannot afford for us to wait on the right training or professional development to come to us. We must go out and find what they need; we must seek the information we need in order to be the best we can be. It is time for educators to take charge of their own learning. It is time to get PERSONAL. I have always been an avid reader and researcher. I thrive off of searching for the latest information and best practices in education. My family calls me a “nerd”, and I am perfectly fine with that! Over the last year I have been honored to grow a Personal Learning Network (PLN) filled with thousands of educators, business leaders, organizations, and writers who have challenged my thinking and broadened my perspective. The connections I have made have pushed me to try new things, dream bigger, and be more than I ever imagined I could be. Personalizing my learning has empowered me beyond measure, and experiencing this has allowed me to see that we should all be more purposeful about our learning. Waiting for a training in the summer is no longer acceptable. We are professionals and we need to be regularly seeking knowledge which will support ourselves, our profession, our school, and most of all…our students. Teachers are some of the busiest people I know. We plan for many children who are all learning at different levels and in different ways. If we do not stay current and continually seek knowledge to help us better reach individuals in our schools, then we are failing our profession. We must be the lead learners. We must be learning constantly. The following suggestions are a few ways I have personalized my own learning over the last year. These actions have helped me grow as an educator and as a person. I hope they can help you do the same. Develop a personal learning network of people in your circle as well as others outside of your district, state, and even country. Connect with others via Twitter, Google+, Facebook, LinkedIn, etc. When you begin to connect you will be amazed at the plethora of resources that will be shared with you. Articles, videos, websites, books…all at your fingertips through your smartphone. Grow your network today by getting connected. This takes time, but it is time well spent as you will begin to receive uplifting and informative blurbs through your social media feeds. One article or blog may be the answer you have been looking for to help a student. 15 minutes of your time to read an article could change the whole dynamic of your classroom. What have I learned over the last ___ that has made me better? Who is counting on me to learn, and what do they need from me? What do I need to learn for my own inspiration and to develop a passion? Reflect on these questions and let the answers guide you to what you need to learn next. Once you are ready, you will know it! You will be armed to seek out knowledge that will empower you like never before. We have goals for our students regarding their independent reading, so why not have goals for ourselves? My personal reading goal is to study one book a month that will help me grow. I also challenge myself to find at least five articles or blogs each week that will stretch my thinking or introduce me to something new. Articles and blogs are short and to the point, giving me a taste of a new concept. I can then decide if I want to further my knowledge in this area. Short reads are also great sources of inspiration and validation. I find myself reading blogs/articles from Twitter, Facebook, Google+, and LinkedIn while I am waiting on a prescription, sitting at ball practice, or any other moments I can find. Once you establish your PLN, you will see the endless amount of resources available to you just because others choose to share them. As important as it is for you to seek your own learning, it is just as important to share with others what you learn. This is where the power of the PLN shows. When you share a source, you may be serving someone you do not even know. You may be helping a classroom of kids in another state or country. You may, in fact, save a person from their distress and concern over not knowing what to do about a student. I can think of nothing more powerful than to collaborate with others in a network where the goal is to become better. When you find a great resource, share it with others so the gift continues. We are in the business of serving children, and empowering them to one day be leaders of our society. We cannot possibly take this challenge on alone; we are much stronger together as network. As you read, research, and learn,you will be applying new concepts and strategies into your own environment. The more passionate you are about your learning, the more powerful the impact on others around you. This is how we birth change. This is how we deter from the way things have always been done, to try something new and innovative. Find your passion, and let it show with those around you! Will you be judged in a negative way by some naysayers? Most likely so. The impact you will make on others will negate those who are hesitant to buy in. Passion speaks to people, and there is no time like the present for your passion to be revealed. These suggestions are not rocket science by any means. They are simple ways to infuse continuous learning in your life. We are educators, and if we do not learn something new each day, then we are not reaching our full potential. Kids and their families are counting on us to support them. They are putting their trust in us to do what is best. We can consider that a burden, or a blessing. What will you learn today? Tomorrow? Be a knowledge seeker. Become a master of learning. Don’t wait…start today. This entry was posted in education, professional learning and tagged Education, School Administrators, school leaders. Bookmark the permalink. ← Who Says God Can’t Be in Our Schools? Fabulous connection between the value of personal & professional growth mindsets. Not always easy – especially when things get busy! Thank you for sharing your goals and the value of reflection – something I am working on as I build confidence in the read-write connection (read/blog/vlog) and in following a statement a valued colleague regularly mentions: you gotta read to lead! Ian that’s wonderful! Thank you for the feedback! 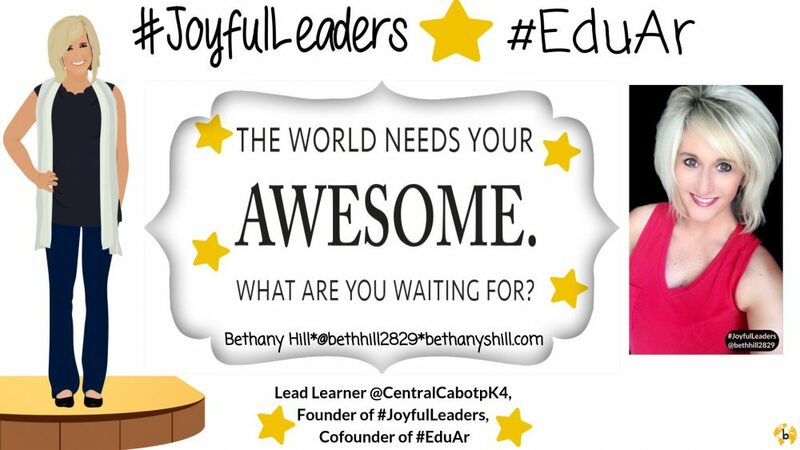 So happy that you’ve included me in your PLN – I’ve learned a lot that has enhanced my education leadership! Thanks for sharing your journey so openly!